Bullion Exchanges offers one of the most demanded coins in the world, the Silver American Eagle which is housed in a special Trolley label. 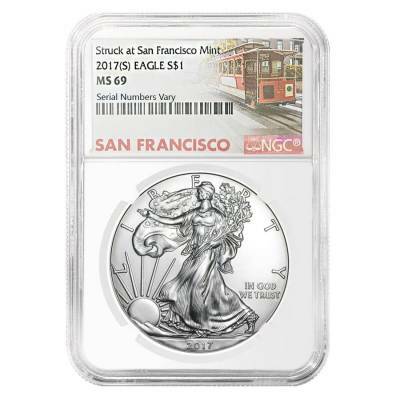 According to the increased demand for Silver American Eagles in recent years, the U.S.Mint began producing the Silver Eagles at the San Francisco Mint again in 2011. Before that year the Silver Eagles were only produced at the United States Mint's West Point facility. This series is a renowned silver bullion, first established on November 24, 1986. These coins present the finest American traditions of patriotism, freedom, and equality. The American Silver Eagle is the official silver bullion coin of the United States. They have been struck only in the one-troy ounce size with a face value of one dollar and from .999 fine silver. The outstanding image of Lady Liberty depicted on the obverse, portrays her striding toward the rising sun. This design, created by Adolph A. Weinman in 1916, is called the Walking Liberty. The official motto of the United States, ‘In God We Trust,’ is imprinted next to the image of Lady Liberty. 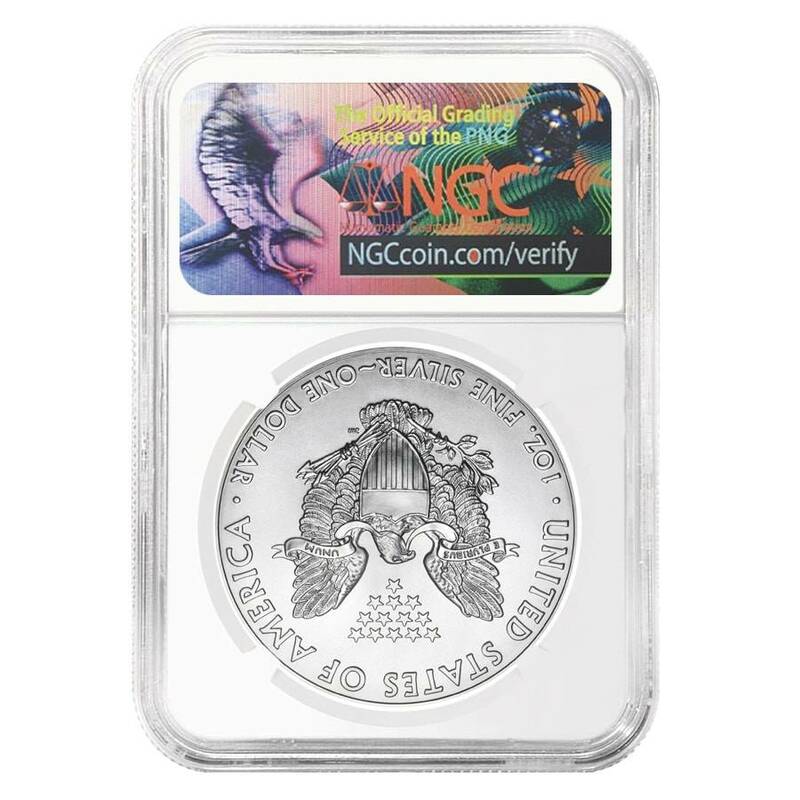 This coin was verified by the trusted grading company - NGC as Mint State 69, which means that there are less than two visible imperfections on it under. This designation not only adds value to coin, but also takes coin collecting to another level with unique opportunities to protect your portfolio. The Numismatic Guaranty Corporation (NGC) subsumes these coins with a mintmark and the facility name, for example, a coin struck at the San Francisco Mint in 2017 will be described as a “2017 (S) EAGLES S1 ”. This title comes with NGC designations and other special labels. The Professional Coin Grading Service (PCGS) provide the mint attribution by using “S” for San Francisco, “P” for Philadelphia, “W” for West Point, e.g. 2017-(W) and their original labels. Coin struck from .999 pure silver, weight of 1 troy ounce. Coin was produced at the San Francisco U.S. Mint facility and comes in special NGC Trolley label. Obverse: Displays Lady Liberty moving towards the sunlight while holding a laurel oak in her hand, symbolizing America’s strength. Design by Adolph A. Weinman. Inscriptions include “LIBERTY,” “IN GOD WE TRUST,” and the year of mintage. Reverse: Features a heraldic eagle below 13 small stars, which represent the original American colonies. Inscriptions include “UNITED STATES OF AMERICA,” “E PLURIBUS UNUM,” along with the weight and denomination. With Bullion Exchanges, you can feel confident that you will get only high-quality silver! Every silver coin offered in our collection is 100% authentic. This 2017 (S) 1 oz Silver American Eagle Coin NGC MS 69 (Trolley Label) will be safely packaged and delivered to you. For any questions, you can reach us at 800.852.6884 or simply message us, our customer service associates will be happy to assist you. American Eagle has been a must have addition to any portfolio for ages. I like how US Mint adds some new details to these timeless coins, making them even more demanded. Great!